Here are some photos of my production work in process. For this work I lay things out in a sort of assembly line fashion. 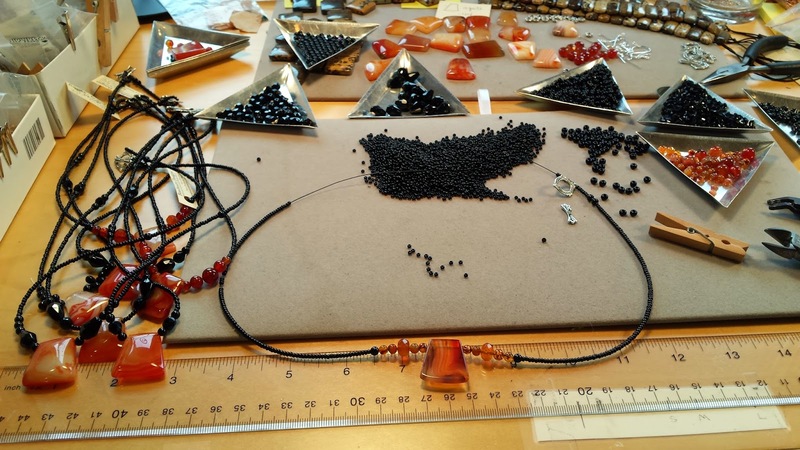 First I layout the pendant stones and choose coordinating seed bead colors. Next I pull out accent beads and clasps. Then I begin creating each necklace. Another example with red agate. All those new necklaces need to be added to my inventory spreadsheet and then tags must be printed, punched and labeled. 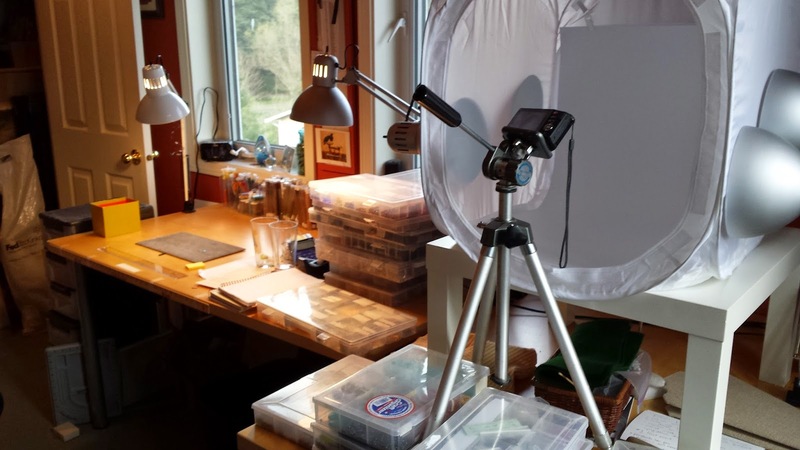 The last steps are to photograph each piece and then package them. 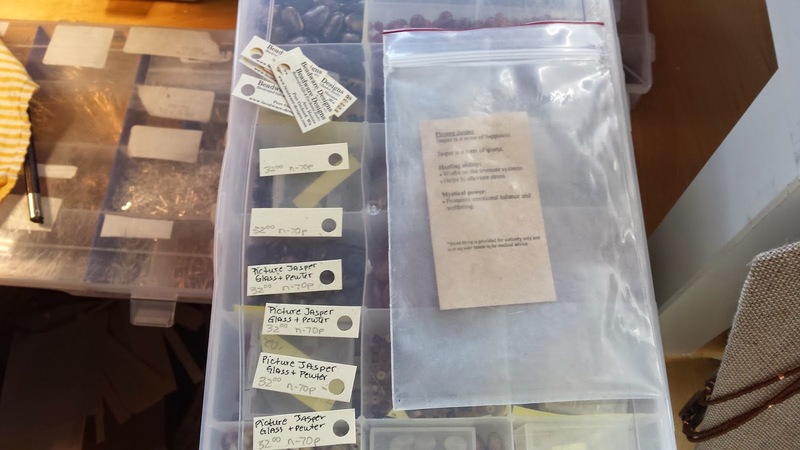 While I love creating individual, one-of-a-kind pieces of jewelry, I sometimes need to do what I refer to as production work. To me this means taking a design that has been popular, is easy to make, and I have plenty of supplies for and then making many repetitions of this design. During the show season I am so busy that I turn over my inventory fairly rapidly. So production work is a necessity when you are trying to sell enough to pay your every day bills. 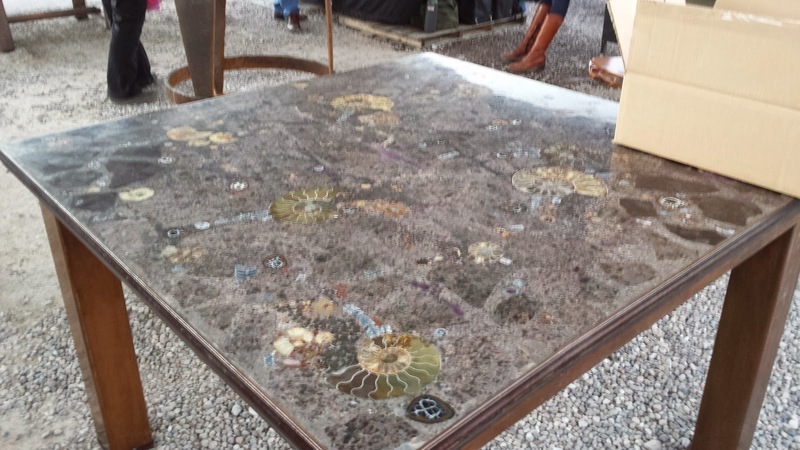 I still try and add some individuality to each piece by changing an accent bead, the color theme, or the metal used. Here are some recent examples. 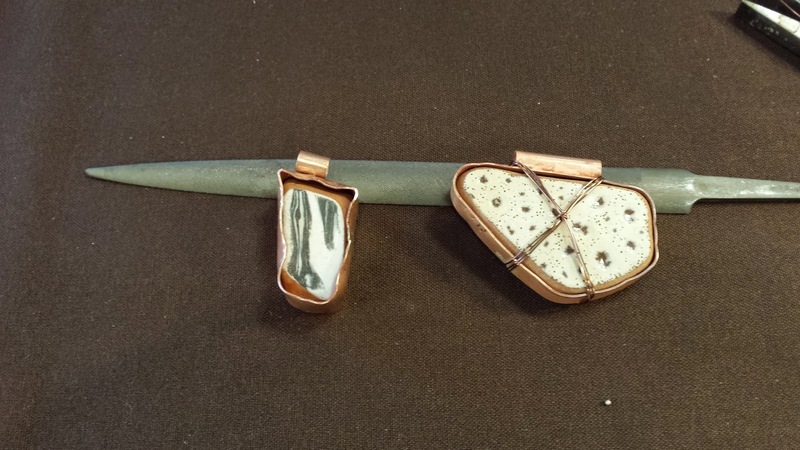 In this first series I am using a small wedge of picture jasper as the focal stone. This batch is black seed beads and various pewter accents with pewter clasps. Next up I switched to using brown seed beads and copper or pearls with copper clasps. The last batch I went back to pewter, but this time with a grey blue seed bead. In this series I stuck with the same overall design, but used a wedge shaped agate. Here they are mixed with agate accents. 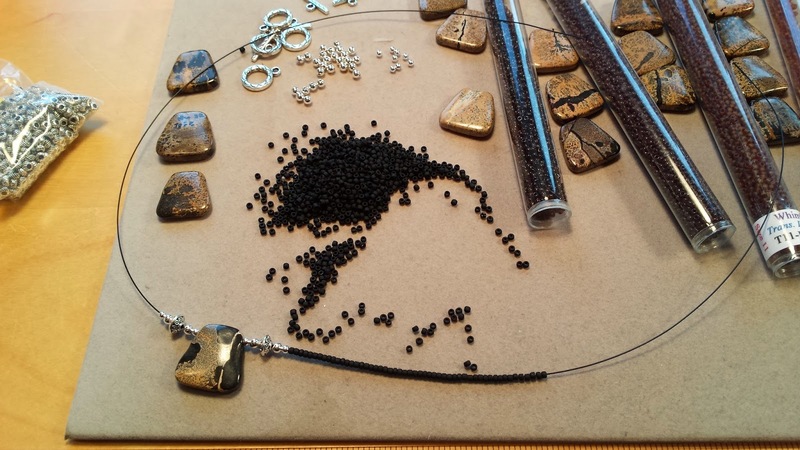 And in the last batch I used black glass beads as accents. 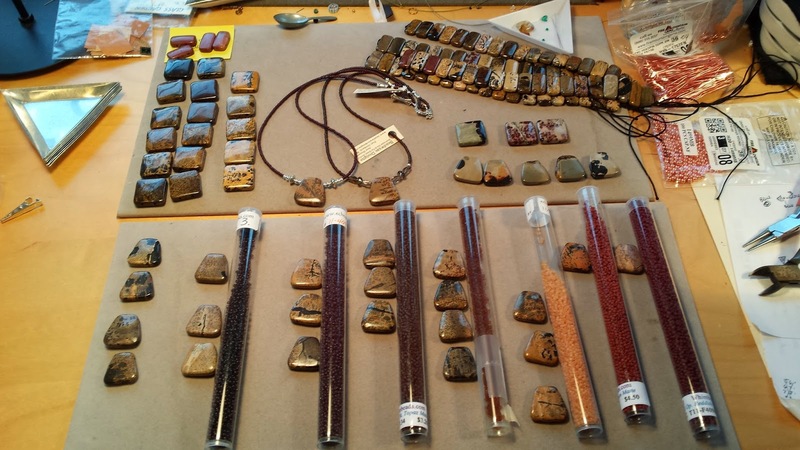 Beads, Stones and Rocks, Oh My! 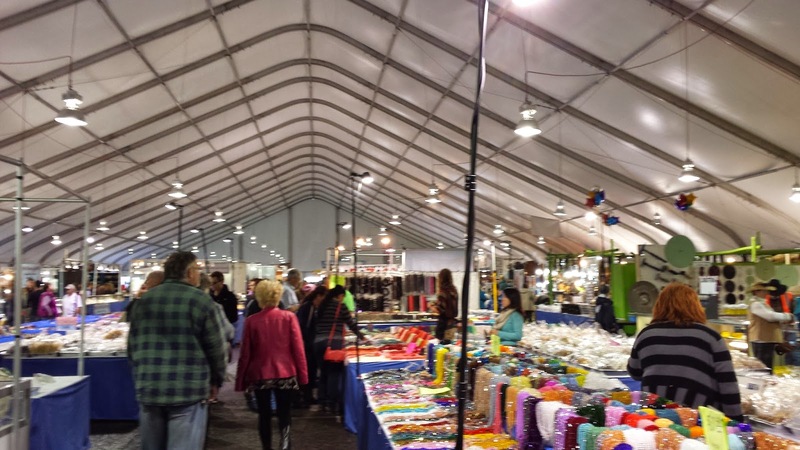 For the first time I ventured south to the Tucson bead shows. What an experience! I knew there were a few different shows. I figured in 4 days I'd have a chance to see most of it. Boy was I in for a surprise. 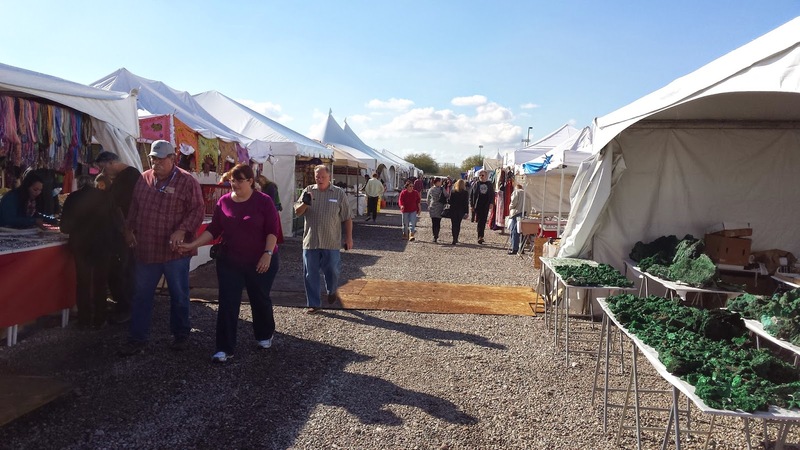 There were 40 venues each with hundreds of vendors!! I did not even scratch the surface. So much to see. 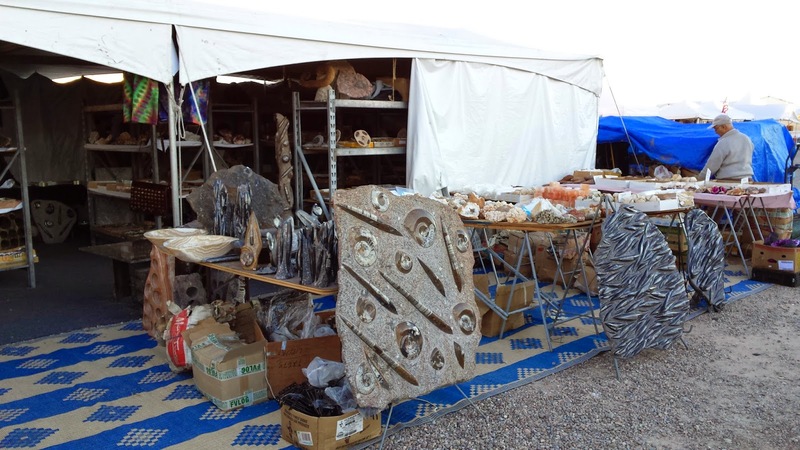 My favorite was a huge indoor outdoor market, some called Electric Park. 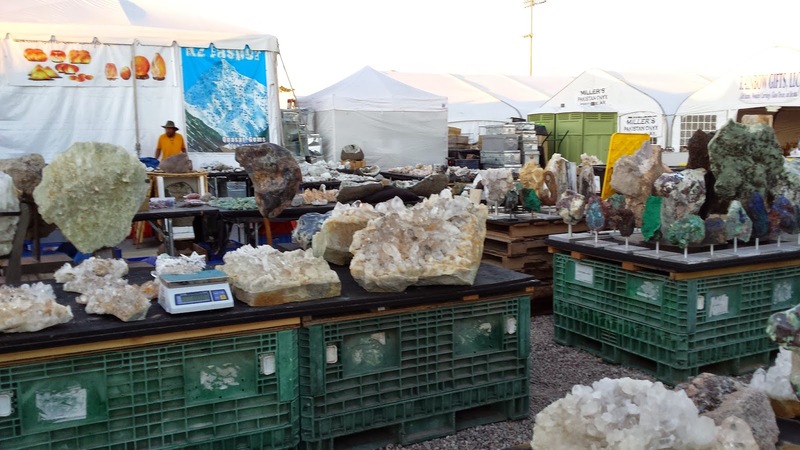 Everything from fine gemstones, to stone beads, to raw rocks and boulders and even some tables, sinks and garden art. Another first was taking classes. Even though I have been creating jewelry for many years, I have never taken any classes. There were many to choose from so I decided to focus on learning a new skill, torch soldering. I really enjoyed myself and wondered why I waited so long! The first class was all about the science of soldering. We had a little time to get introduced to a small butane type torch and do some basic soldering. Next up was a class on using that knowledge and making some simple findings. 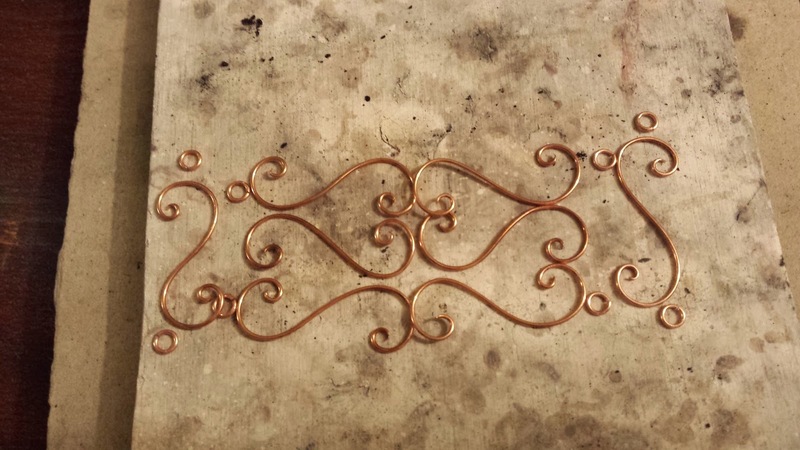 My next two classes were more soldering, this time detailed work using a more complex torch. 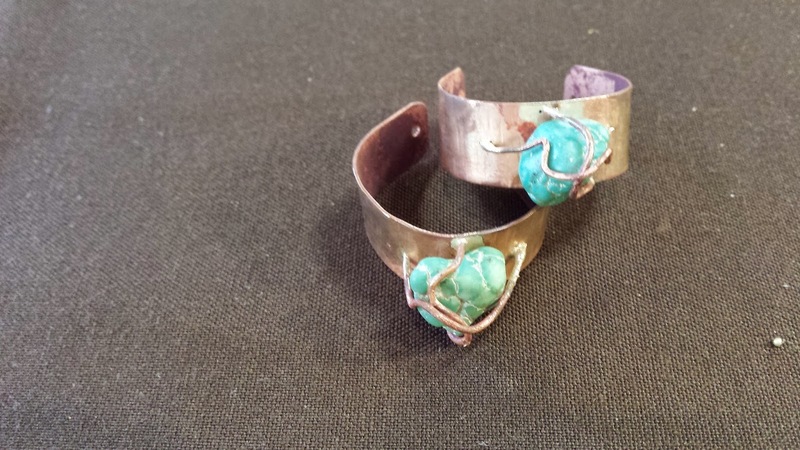 First I practiced making copper earrings with a small cage to hold a stone. The next class I made open bezels, enclosing pottery shards and attaching a tube hanger. I will need a lot of practice to master soldering. While I seem to have some of the ergonomics and techniques down....I am too impatient and tended to nuke my pieces to death! My last class was for fun - making a bracelet using all cold connections. 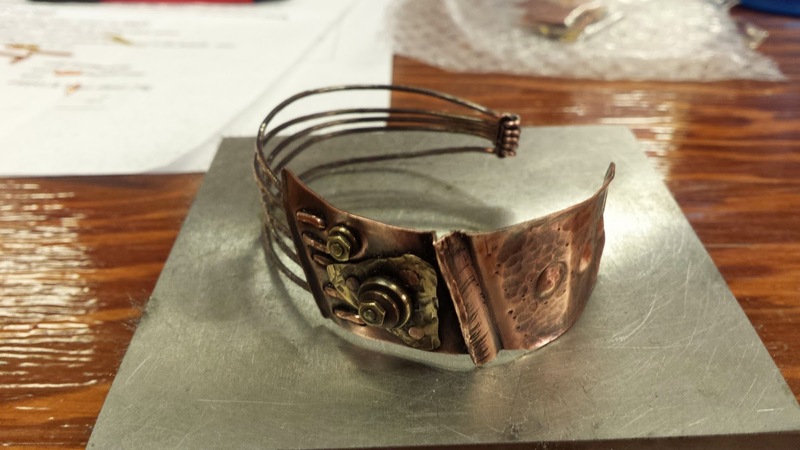 I used rivets, screws, and hammers to create this really cool bracelet. The instructor also showed me how I can incorporate a stone. I loved this class! You will definitely see some of these techniques in my work later this year. In between classes I shopped. I had set myself a budget and had a few things on my list. Mostly I wanted to look for things that jumped out at me. Interesting colors, shapes and high quality. All of the vendors I dealt with were so nice! For most purchases I managed to either talk them down or get things thrown in for free. I ended up just slightly over budget but got some really nice stones. I hope to be able to return next year!! These were one of my good buys from the Tucson shows. This bunch was mixed in with a heap of others like it, but for some reason this bunch jumped out at me. I held them up and asked how much. The seller gave me a price, and I asked "per strand"? And he said no for the lot. Sold!! I see them as small pendants on dainty necklaces and as statement earrings. 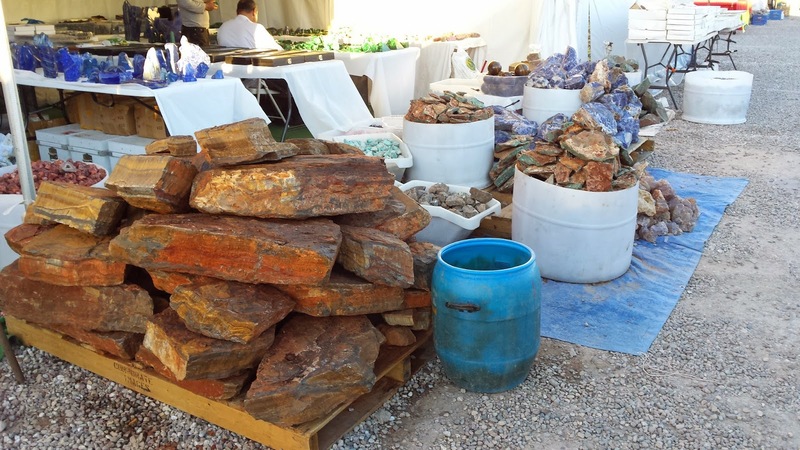 The name of this stone comes from 'lapis', the Latin word for stone, and 'azula', which is Arabic for blue. This opaque, deep blue gemstone has a grand past. It was among the first gemstones to be worn as jewellery and worked on. At excavations in the ancient centers of culture, archaeologists have again and again found among the grave furnishings decorative chains and figures made of lapis lazuli – clear indications that the deep blue stone was already popular thousands of years ago among the people of Mesopotamia, Egypt, Persia, Greece and Rome. Another of its earliest uses was as a pigment for paint. It was ground up into a powder and mixed with binding-agents to produce the intense, but expensive, ultramarine color favored by many early Masters such as Michelangelo. Many pictures of the Madonna, for example, were created using this paint. Unlike all other blue pigments, which tend to pale in the light, it loses none of its radiance. Today the blue pigment obtained from lapis lazuli is mainly used in restoration work and by collectors of historical paints. Lapis lazuli is regarded as a stone of friendship and truth. It is said to encourage harmony in relationships and help its wearer to be authentic and give his or her opinion openly. This stone is a powerful crystal for activating the higher mind and enhancing intellectual ability. It stimulates the desire for knowledge, truth and understanding, and aids the process of learning. It is excellent for enhancing memory. Lapis lazuli is also thought to relieve general pain and inflammations, and is especially effective against migraine headaches. It aids the nervous system and brain disorders, and is believed to help with attention-deficit, autism and Asperger's syndrome. Lapis lazuli is one of the oldest spiritual stones known to man, used by healers, priests and royalty, for power, wisdom and to stimulate psychic abilities and inner vision. It represents universal truth. It quickly releases stress, allowing for peace and serenity. It permits tapping into personal and spiritual power. Note: This information is provided for curiosity only and is not meant to be medical advice.